With roots in mindfulness and relaxation, teaming yoga with cannabis seems like the perfect combination. And that is exactly what one couple has done with their studio Lit Yoga, which combines marijuana, meditation and the Hindu-based aesthetic discipline. Hannah Paxton and her partner Julian Brand first launched their concept in May 2017 and have been gaining a growing following ever since. 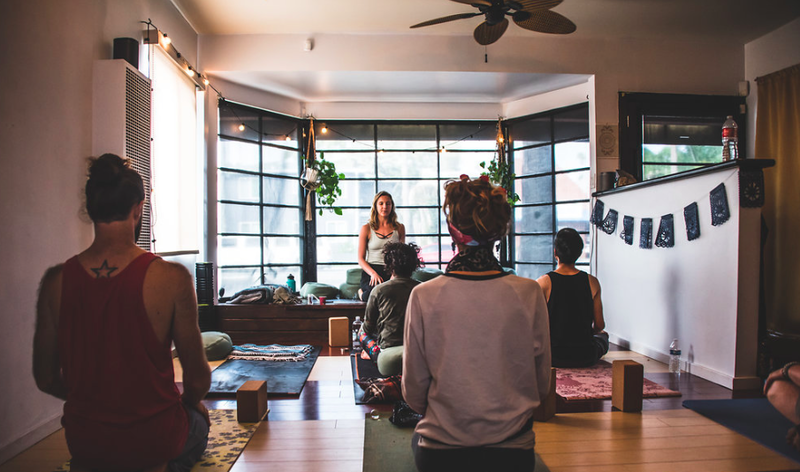 Their intimate studio in Venice, California enables budding yoga practitioners to partake in something a little more mind altering before they start to stretch and meditate. Explaining the concept behind Lit Yoga, Brand says, “We are a cannabis wellness space and lifestyle brand, and we educate on the health benefits of cannabis and mindful consumption when combined with practice. We wanted to be the first cannabis yoga studio, the first cannabis yoga brand. Brand first started using cannabis to enhance his experience while studying Bikram yoga, a practice in which the space is heated to as high as 108 °F. Meanwhile, Paxton, who has been a dancer her entire life, says she realized early on how marijuana could enhance her physical and spiritual experience while honing her art form. “I grew up dancing and for me I always used cannabis,” Paxton explains. Ahead of the yoga session, yogis are encouraged to enjoy a herbal infusion… and a herbal infusion. First meeting at the Burning Man-style Lucidity Festival in Santa Barbara three years ago, the couple’s first foray into a cannabis-based business involved hosting events and dinners, which ran under the umbrella of Tree Lounge. The couple, who pride themselves on being very “health aware,” soon struck on the idea of combining cannabis and yoga in an environment that promotes wellness and mindfulness — and their business was born. However, Lit Yoga is not just focused on getting high — rather, it’s about experiencing the health benefits CBD can have on the body while stretching and meditating. 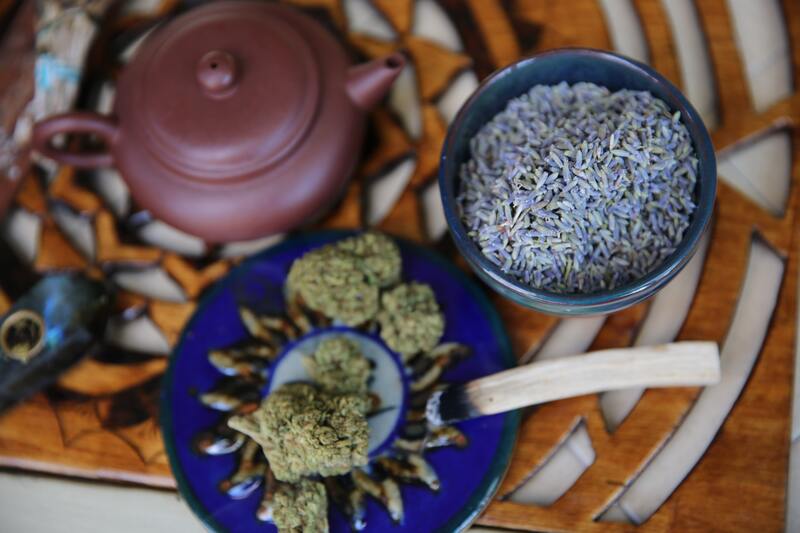 Lit Yoga also has another unique twist — practitioners are encouraged to take part in a Chinese-themed tea ceremony before each class, so they can bond with one another as they sample various brews, tinctures, oils, sprays and pre-rolls. Paxton, who used to work at a Chinese teahouse in San Francisco, even makes some of the tea herself. A blend of rose buds, lotus stamen and lavender is served alongside fermented pu-erh tea from the Hidden Peak Teahouse in Santa Cruz. 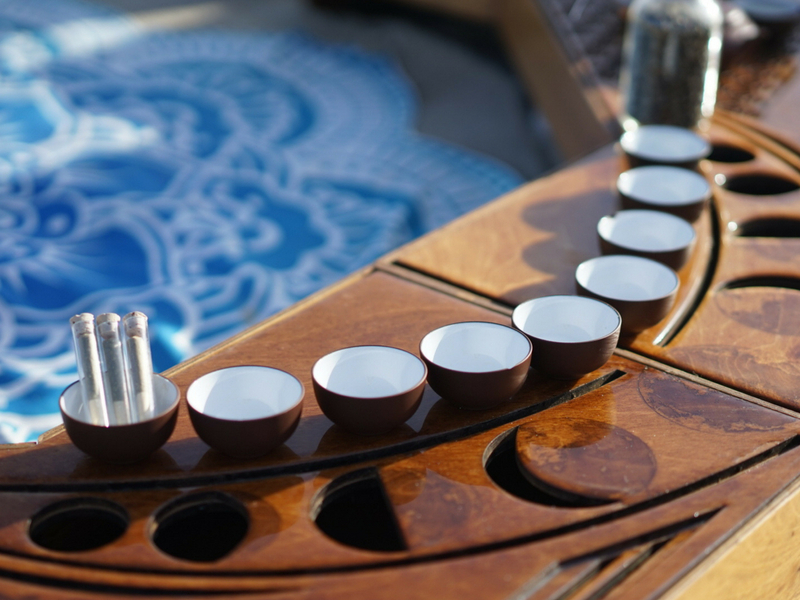 The style of Lit Yoga’s particular tea ceremony is Gongfu Cha, meaning “making tea with skill,” which aims to produce a brew that tastes good and is satisfying to the soul. This ritualized preparation and presentation originated in the Fujian and Chaoshan area of eastern Guangdong in China. When it comes to stretching and meditating, CBD can help relax the body and the mind — although, some opt for a THC experience. Careful about what cannabis products they work with during the classes, the couple chooses to focus only on the organic and natural. “We want to make sure all the products are clean and pesticide free,” asserts Paxton. “We definitely lean toward a sun-grown outdoor flower, rather than indoor. Attendees who take part in a Lit Yoga ceremony have the option of CBD and THC for consumption before the class begins. Lotions and oils by Apothecanna, Hälsa roll-on oil blends, Jambo Superfoods CBD mouth sprays, and Henry’s Original CBD and THC pre-rolls are just some of the products students can use to heighten their yoga experience. “We are teaching people there are other ways to consume cannabis, other than smoking. … There are many ways you can incorporate [cannabis] into your wellness routine without getting high,” explains Paxton. People attending the class are roughly split down the middle as to who wants to incorporate CBD into their yoga practice, and those who are after a THC psychoactive experience. Also offering instructional teacher training as part of their burgeoning yoga brand, the couple is now looking to expand into a larger studio, while ensuring classes are kept to no larger than groups of 20. For more information on Lit Yoga and to schedule a session, visit Lit Yoga.